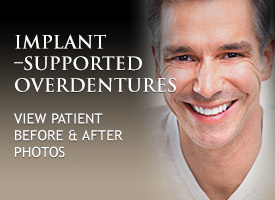 Dental implants are an option available to replace missing teeth. A dental implant is a titanium rod that is fused to the jawbone in order to function as the tooth root, which will support a dental crown. To replace multiple missing teeth, a few implants can hold a bridge, dentures, or partial dentures. The replacement teeth will look and function like natural teeth and can improve a person’s ability to smile, speak, and chew properly. Few people know that when a tooth is lost, the lack of stimulation to the supporting jawbone causes a decrease in bone volume and density over time (atrophy). As the jawbone shrinks, the overlying muscle and skin collapse along with it, which can make a person appear older than their actual age. Dental implants prevent the wasting away of the jawbone by serving as an anchor for the new teeth. 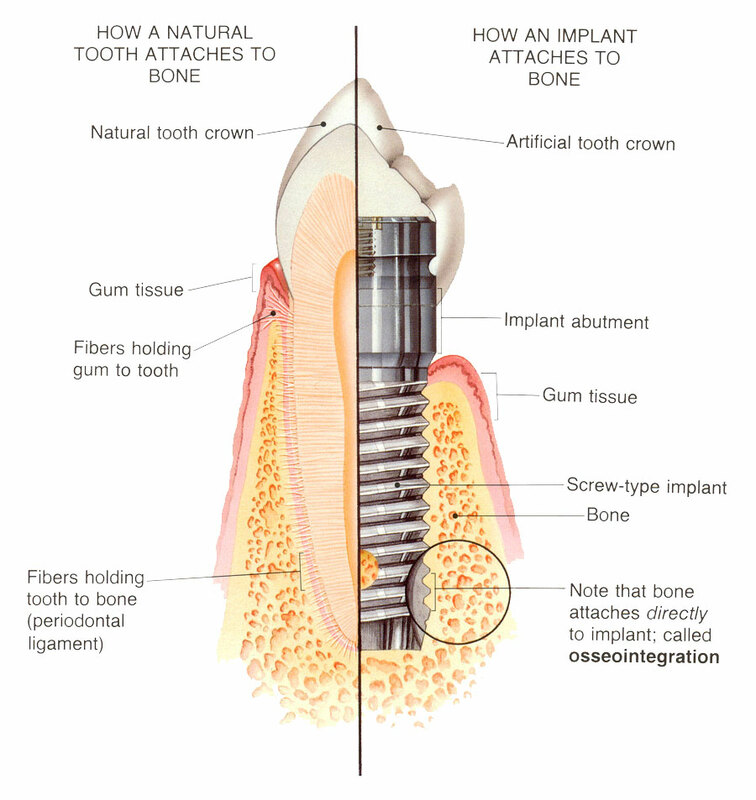 During the recovery process, the jawbone will literally attach itself to the dental implant, a process known as “osseointegration.” As chewing forces are transmitted to the bone surrounding the dental implant over time, bone growth is stimulated and bone density and volume is maintained. Since much of the bone loss from a missing tooth will occur within the first year after tooth loss, it is best to install the dental implant as soon as the tooth is extracted. Dental implants are made of titanium, which permanently fuses to the jawbone. According to credible research, 25 percent of bone loss occurs during the first year after tooth loss and will gradually continue throughout life. Dental implants inserted soon after tooth extraction can prevent bone loss from occurring. Dental implants are a more reliable alternative to dentures or fixed bridgework because there is no risk of developing bone damage. Dental implants are the only prosthetic that offers a replacement root system; other prosthetics rely on surrounding structures for support. 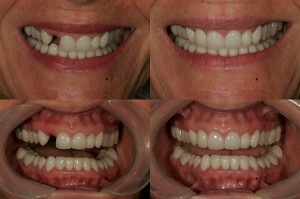 Dental implants are a solution for patients of all ages, with the exception of growing children. Although ideal candidates are those who have good oral and general health and have adequate bone mass, dental implants may be used on patients who do not meet these criteria. Dental implants have been successfully placed in those who have existing medical conditions, such as high blood pressure and diabetes. Those who have lost their teeth and have experienced bone loss as a result of periodontal disease or decay have also experienced good results with dental implants. 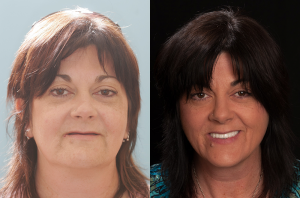 Certain procedures, such as ridge augmentation or a sinus lift, may be necessary to improve jaw deformities or to ensure that the dental implants have enough bone to attach to. During a consultation at Art of Dentistry Institute , your health history and the oral and dental structures will be assessed to determine if you are a candidate for the procedure. Endosteal Implants — The most common type of dental implants, these are surgically implanted directly into the jawbone. 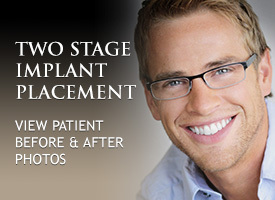 Subperiosteal Implants — Subperiosteal implants are placed under the gum but above the jawbone. These dental implants are for those who have a shallow jawbone but cannot or do not want to undergo a procedure to rebuild it. Your dentist will determine the type, number, and location of the dental implant(s) needed for the restoration during the initial phase, and arrangements will be made to have the dental implant(s) put in place. The titanium implant is placed in the jawbone and is allowed to heal for three to six months before the restoration is installed. Typically, an interim restoration is worn by the patient during the healing time. This final step involves the fabrication of the artificial crown that is securely anchored to the underlying dental implant. The overall success of the entire dental implant depends on the anatomic situation of each individual patient, the expertise of the dentist and the dental laboratory, and the communication between them. Dental implants can be immediately placed into fresh extraction sockets on the same day , which limits overall treatment time and offers some esthetic and functional advantages. If you are considering immediate dental implants, you will first meet with expert cosmetic and Implant dentist Dr. Hawary, who will take a complete history from you about your medical history and current health, to make sure that you are a candidate for dental implant surgery. Dr. Hawary will examine your teeth, jaw and gums; and review your x-rays. He will take impressions of your teeth to make a diagnostic wax-up before the surgical appointment, to fabricate the temporary restoration. This simplifies the clinical procedure and limits chairside treatment time. A traumatic tooth extraction is the first and one of the most critical steps of immediate dental implant placement as it minimizes loss of bone and soft tissue, and reduces postoperative swelling. Once the dental implant and abutment are in place, Dr. Hawary will place and adjust the temporary crown to protect your implant as it heals, and allow you to smile, speak and eat normally. If you need to replace one, a few, or all of your teeth, dental implants may be the solution for you. 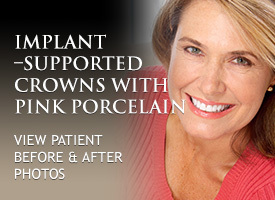 Please schedule a consultation at Art of Dentistry Institute in Orange County by calling 949-955-3366. We look forward to hearing from you!